Jennifer is an alumna of Stetson University, class of 2016. Jennifer earned her Bachelor of Business Administration and is currently working on her Master of Business Administration at Stetson. She is on her way to becoming a Double Hatter! During her undergraduate time at Stetson, Jennifer wore many hats as a student employee in the Office of Admissions, a Resident Assistant and a member of the Top Hats Dance Team and Fellowship of Christian Athletes. She also worked as a graduate assistant for the Office of Admissions during her graduate program before joining the admissions team full-time as the assistant director for transfer admissions. 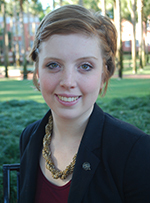 Jennifer is eager to help create a wonderful Stetson story for transfer students. "Stetson has been such a big part of my life and my story. The most exciting part of my job here at Stetson is to be a part of someone else's journey at the university that I know and love. I love waking up every day knowing that I will create value for the students that I work with."